AIDS/HIV was a disaster for the people in Africa. Many, many men and women died, and left a lot of children without parents. Only in South Africa the estimate is that there are 3,5 – 4 000 000 orphan children. On top of this unemployment, drug-problems and other things makes many children left alone. In South Africa orphan children is being taken care of relatives, sometimes living far from where the childrens parents lived. Very often their relatives are extremely poor. It´s this vulnerable children our project is aiming for. And we named the project Dandelion, because like the flower our children have to struggle hard to make a future. WHAT IS BASIC FOR OUR CHILDREN? If you don´t have food enough it´s hard to grow and develop. Many of our vulnerable children is only having one meal per day – the one they get in school. Besides food they also need health care and sometimes also physical and mental care. If you don´t have parents, you need someone to ask about things in life. Someone that can help you with your homework and to guide you in general. Someone you can trust, and someone who can protect and support you in all matters. If you want to change your life, education is very essential. All our vulnerable children goes in a Star for Life-school. Here they are also tought to express and behave correct, and also the importance of establishing goals for the things you want to achieve. In other words to ”go for their dreams”. Next step for higher education is not only about skill, it´s also about money. Education costs. The paving ended several kilometers ago, and now the road is more like a washboard. The rugged South African savannah landscape with its red soil pours down everything and everyone. “Although it’s worse during the rainy season, then it’s not even possible to drive here,” says our guides from the Star For Life-organization. We have crowded us together in the car after picking up the brothers Kheta, 13, and Sbonga, 11, in their school. We are going home to their house which is on a hill, and now the road has become two reels. And it gets worse when we turn on to the wheel tracks up to something that best can be described as a shed. Kheta opens a shaky door without lock, and shows us in. The room contains of two dirty beds with even dirtier bedlinen. Some old plastic bunks that are probably used to wash yourself, some wooden boxes and storage shelves used as tables and furniture, and hardly much more. Here, the brothers Kheta and Sbonga lived together with his younger brother, Sbu, 8, until just a few years ago. Lonely, with only supervision now and then by an elderly woman. An unimaginable misery that causes tears in your eyes. “But now it’s better, tell our guides, now Kheta and Sbonga have moved to an “uncle” and Sbu has joined another relative. And because of that, both school life and school results are much better. The situation of the three brothers is not unique in the AIDS / HIV-affected South Africa. When they were young their dad died, and only a few years ago, even their mother passed away. Orphaned children are usually taken care of by any relative or a close friend, which causes them to get up from home and end up with someone who hopefully cares for them. We continue, and drive off the wheel tracks again. This time we walk through a gate, and drive up to a slightly larger rectangular house that has a round house with thatched roof next door. The door of the round house is locked, and Kheta runs away and retrieves the key. He opens, showing us into their “house”. Here, there are two bedded beds, with some clean linens. There is a small desk with some books, and on the wall hangs posters on African football players. What team do you support, we wonder. – Orlando Pirates, says Kheta a little bit shy, and Sbonga nods in agreement. Orlando Pirates is one of the best teams in the South African league, and comes from Soweto outside Johannesburg. Everything is relative, and in comparison to the previous home, their room feel almost cosy. But there is no electricity and no running water. Water they can get a few hundred meters from their house. At the center of the desk is a framed photo of a smiling African woman in the typical colorful clothes. And just as we suspect it’s their mother. The only picture they have on her. Missing a school day is not just losing a day’s teaching, it’s also missing a meal. At school, all the children get a cooked meal, and then they hopefully will have something more to eat at home. Which is not always the case. 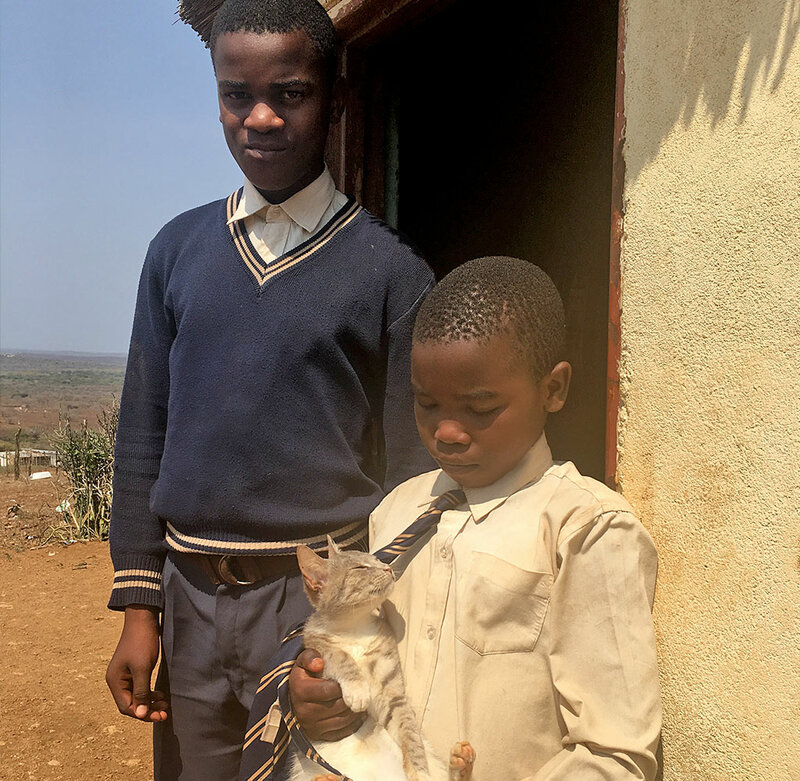 On our way back to school (the two brothers have to walk the distance every day which take them 15-20 minutes in either direction), we ask if they miss their youngest brother? – Of course, they both say with one mouth. Back at school again, we change some words with their teachers. We have observed that Sbongas leg is not straight and that he limps. – He had an accident, probably broke the leg that did not heal properly, telling his teacher. But he has not complained that he is in pain. “This is not uncommon, if you have no money for either transportation or healthcare, you are waiting and hope that the injury will heal itself, adds our guides. This story about the brothers Kheta, Sbonga and Sbu is neither unique nor the most heartbreaking. There are much more moving fates to tell, but it is quite typical. The unaccompanied orphaned children have an incredibly tough time in South Africa, and need all the support they can get in order to change their lives. And now we come to the best part in this story – Kheta, Sbonga and Sbu will get it! The Dandelion project – for vulnerable children in South Africa – is for them.